The English Reformation in Ireland began with Henry VIII. ‘Protestant’ policies were forced on the local populace, despite the fact that the majority of them continued to adhere to Roman Catholicism. About the time of the Restoration in 1660, Jeremy Taylor (1613-1667) was resident in Ireland as Bishop of Down and Connor. 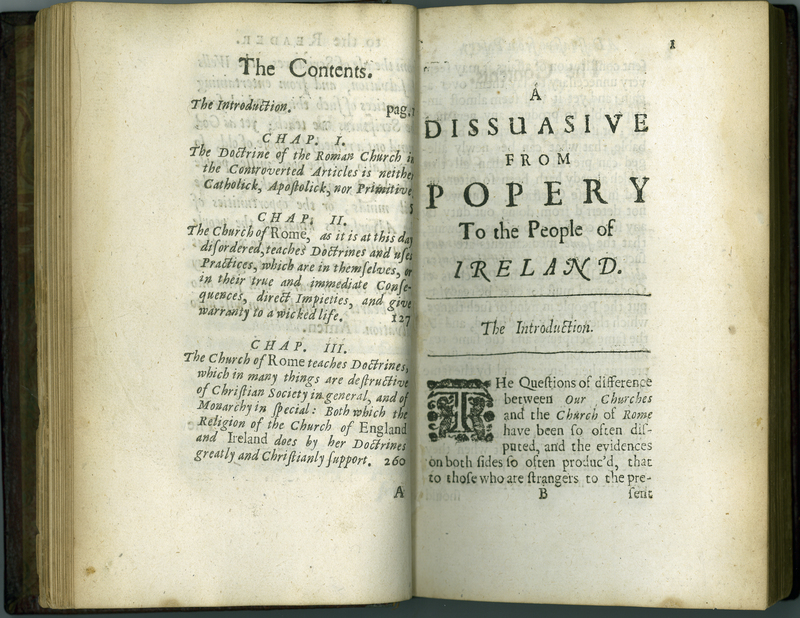 He wrote A Dissuasive from Popery at the instigation of Irish bishops, who thought some treatise might be useful to the common people and check the nuisance of popery. It missed the mark with the Presbyterian clergy, and it was ineffectual with locals, who were not only too attached to traditional Catholic forms of worship, but preferred discourse in the Irish tongue, and not English. Jeremy Taylor, Bishop of Down, “A Dissuasive from Popery,” ourheritage.ac.nz | OUR Heritage, accessed April 26, 2019, http://ourheritage.ac.nz/items/show/10390.